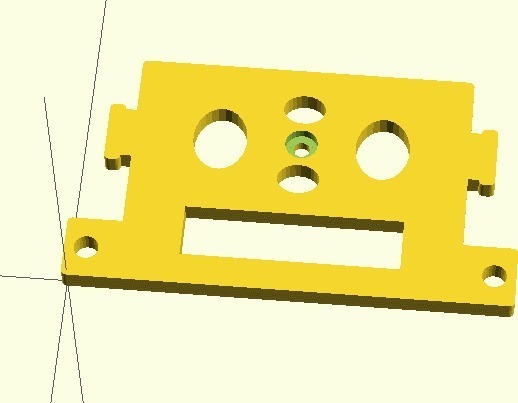 This is my 3D printable take of the Super Simple Gimbal top plate for FPV cameras. Can anyone who is already using the gimbal suggest changes to this design? I am currently in the process of testing this gimbal out with APM 2.5 on my tricopter. Are you going to attach the servo tubes with screws or the zip tie method. If the second you may need to add holes for that. Depending on what camera you wish to use it looks fine to me. Should I shrink the rectangular hole width and add two zip tie holes closer to the tubes? If you want to go that route. I've see other guys find screws to go into the tubing through the hold straight up and down. They say it's for rigidity. It sandwiches the tubing at the hole. Thanks for your suggestions DDSFlyer. I put holes in there to avoid a large print volume without sacrificing rigidity. Else it takes longer to print the part. I think if I bend the tube, I will be able to ziptie both ends at the rectangular hole. Did the 9g servos work with GoPro? They have so far. I think that it's definitely straining to handle even the tubing of my build (bight home depot silicone tubing, dunno if it's more rigid or not compared to the fuel tube). I actually am not sure I'll keep it or not. I kind of like the feel of recording flights off of a smooth tricopter flight vs a gimbal. Kinda takes away the feeling of flight in the video. Unless you have a great subject to record. Also, I think with the HXT servos I get some jitter and a little offset due to the arms not being exactly level due to the gears/teeth. I may try and upgrade the servos but it was just a first stab at this just for the heck of it.